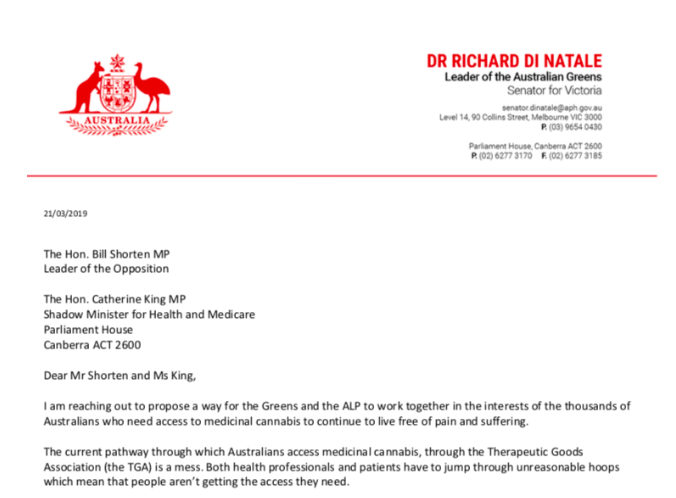 Greens leader Richard Di Natale has written to Labor leader Bill Shorten and Shadow Health Minister Catherine King, calling for both parties to work together to fix up the nation’s “failed” access pathways to medicinal cannabis. 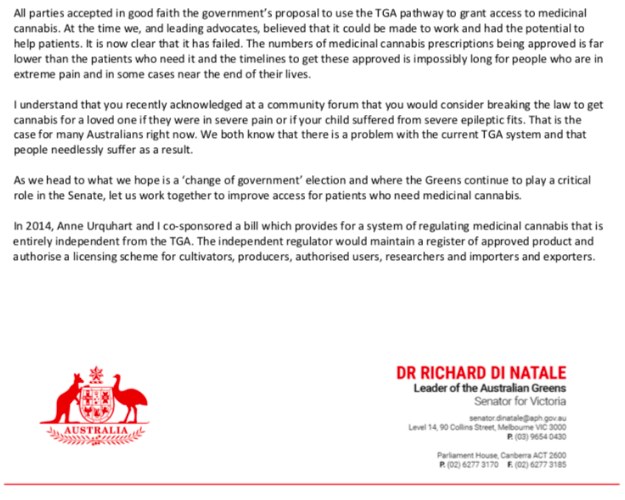 Most of Australia‘s political parties came together when legal medicinal cannabis was first announced and accepted the government’s proposal to use the Therapeutic Goods Association (TGA) as the main body to grant access to medicinal cannabis. But complicated application processes, price, lack of doctor education, and confusion have all slowed the prescription of the drug. “Health professionals and patients have to jump through unreasonable hoops which means that people aren’t getting the access they need,” writes Di Natale. Many Australians have all but given up on legally access medicinal cannabis, regardless of whether or not they’d qualify for a legal prescription. Last year, a panel of some of the most high-profile experts in the industry was held at the University of Sydney and struggled to come to a conclusion on whether or not medicinal cannabis was actually accessible to the public. The Department of Health’s John Skerritt lauded the nation’s apparent 48-hour turnaround online portals, but medical cannabis campaigner Lucy Haslam said her phone “would not stop ringing”with calls from people who had been bounced back by the system. 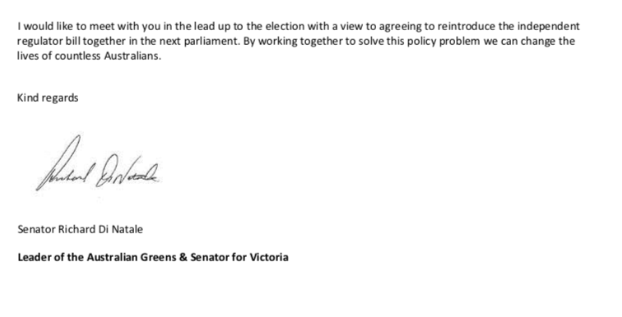 The Greens leader also asks to work with the Labor Party to reintroduce an independent regulator bill in the next parliament. “By working together to solve this policy problem we can change the lives of countless Australians,” he says. 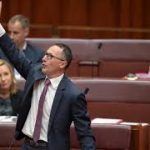 Di Natale will speak on Friday at the annual symposium held by United In Compassion,the medical cannabis advocacy and research organisation fronted by Lucy Haslam. Haslam’s son, Dan, was the driving force in bringing the issue of medical cannabis access and legalisation to the attention of the public. The organisation now counts former NSW premier Mike Baird, former federal police commissioner Mick Palmer, and actor / singer Olivia Newtown John as patrons. Read the full letter from Di Natale below. Why is Tec Temper Better Than PG, VG, and MCT Oil?